One of the challenges in implementing data quality control processes is the identification of technical data quality requirements for the organization. It is important to identify and understand the business requirements for your data before translating those into technical data quality requirements that define good-quality data. An effective data quality control process is based on the understanding of how data and information products are used within and outside of the organization. Each organization defines good-quality data differently and bases this definition on the intended purpose and use of the data. 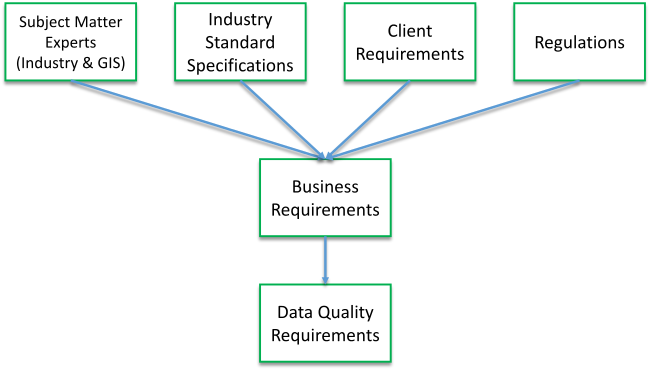 The following diagram illustrates a variety of sources for data quality requirements that may be applicable to your organization. The presence or absence of features, their attributes, and relationships in a data model. A degree of adherence to preestablished rules of a data model's structure, attribution, and relationships as defined by an organization or industry. Many industries follow standards that are reflected in a geospatial data model as value domains, data formats, and topological consistency of how the data is being stored. The accuracy of the position of features in relation to Earth. The accuracy of attributes within features and their appropriate relationships. The quality of temporal attributes and temporal relationship of features. A data quality requirement to an application and its related functional requirements. A quality assurance (QA) plan is a document that identifies which quality standards are relevant to a project and methods to achieve them. A QA plan is a living document that will change as new quality requirements are identified by the organization and also serves as an opportunity to bring together key stakeholders to build a common picture of what constitutes good-quality data and the business processes that drive those requirements. ISO/TC 211 Geographic information/Geomatics—International Organization for Standardization (ISO) series of standards for geographic information to define methods, tools, and services for data management for acquiring, processing, analyzing, accessing, presenting, and transferring such data in digital form among users, systems, and locations. Requirements Traceability Matrix—A document that correlates any two baseline documents (one being the source requirements collected for the project and the other being the capabilities of a software product) and requires a many-to-many relationship to check the completeness of the relationship. It is used to track the requirements and to ensure the current project requirements are met. A traceability matrix is created by associating requirements with the software products that satisfy them. The Requirement Category field in the following table illustrates an example of collected requirements that reference some of the data quality elements outlined above. The next step after organizing and categorizing your requirements will be to correlate your data quality requirements to corresponding capabilities found in the ArcGIS platform.